Collection tins are a great way to raise funds amongst family, friends and colleagues as well as local businesses to support Oracle Cancer Trust. Just let us know if you are interested and we will send you a collection tin. Then all you need to do is commit to checking the tin periodically and returning it to us when it starts to fill up. We will supply a replacement and let the collector know how much was raised each time the tins are counted. There is no cost to you and the tins really do encourage others to donate their loose change. It's easy to say that every penny counts, but it is never more relevant when it comes to collection boxes. Paul and Jennifer Taylor from The Rock Inn, Gwent use collection boxes to raise funds in memory of their friend Derek Young. Says Paul and Jennifer, "By inviting our customers to donate, we are making a small but nevertheless meaningful donation to raising funds which will hopefully make a difference." 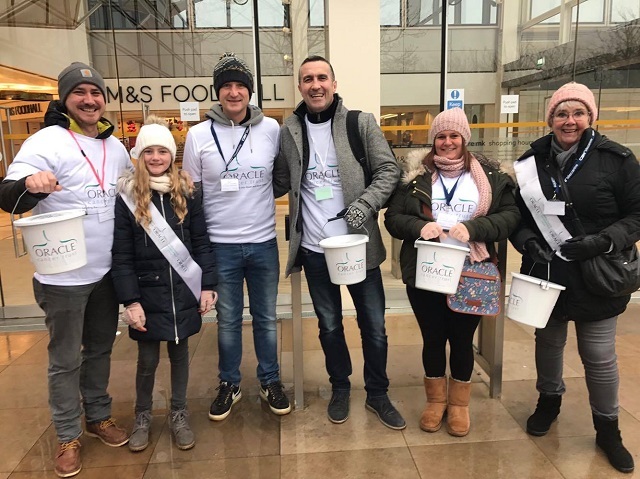 "Our bucket collection in Milton Keynes raised over £250 and boosted my fundraising for Oracle to over £2,500 raised in memory of my stepfather Neil"